This email is about tyres. The physics behind car tyres boggles my little motoring-obsessed brain. A car is connected to the road by nothing more than 4 tiny spots of rubber. If these are not right it is a HUGE safety issue! 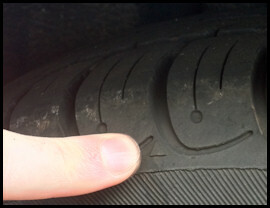 Checking the tyre condition on any car you are about to buy is critical. Simple. Just buy a tyre tread gauge for £1 on eBay. But if a dealer catches you using one of those on a car they are selling they will assume you are a ‘trouble’ buyer and that will kill off any price negotiation prospects. The ‘tyre wear indicator’ sits approximately 1.6mm proud of the groove. 1.6mm is the legal limit. So when the indicator sits flush with the top of the tyre, the tyre needs replacing immediately. But… the performance of a tyre starts to lessen from 3mm and that is when I like to replace my own tyres. 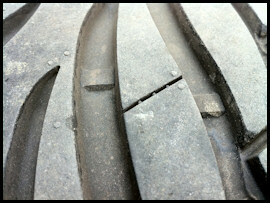 Damage that occurs through hitting the tyre against a kerb can compromise the structural integrity. Bulges or deep gashes in the side walls will mean the tyre needs to be replaced. Any car dealer that sells a car with tyres that need to be replaced is obviously not the type of business you want to be dealing with, so take care. A private seller may just not have noticed; however, this makes you wonder how much care they have taken of the car in general. But when it comes down to it tyres are easy to replace and not that expensive in many cases (www.blackcircles.com is a good place to get an idea of prices), so you can just use this as yet another bargaining chip!